New correct Hurst hatch t-top weatherstrip set for your Firebird or Trans Am. Exact fit for all 76 - 78 models with the smaller Hurst hatches t tops. Complete 4 piece set. This is the early First Design design with the lip that fits over the edge of your headliner for support. The First Design is the more common of the two and found on most Trans Ams. You can easily tell the difference between the two by looking at the roof and headliner inside your car. The First Design used this weatherstripping around the t-tops to hold the headliner up, and the Second Design used plastic trim (much like the later more common Fisher T tops) to hold your headliner in place. Please double check your car and confirm the version you need as this rubber set is non-returnable for any reason. This excellent quality kit is Made in the USA! New correct Hurst hatch t-top weatherstrip main body set for your Firebird or Trans Am. Exact fit for all 76 - 78 models with the smaller Hurst hatches t-tops. This is the early First design with the lip that fits over the edge of your headliner for support. The First Design is the more common of the two and found on most Trans Ams. You can easily tell the difference between the two by looking at the roof and headliner inside your car. The First Design used this weatherstripping around the t-tops to hold the headliner up, and the Second Design used plastic trim (much like the later more common Fisher T tops) to hold your headliner in place. This is a two piece set that goes up your pillar post, around the t top glass, and down the quarter panel sail edge. Please double check your car and confirm the version you need as this rubber set is non-returnable for any reason. This excellent quality kit is Made in the USA! New correct 2nd design Hurst main body T-top weatherstrip rubber set for 1976, 76, 1977, 77, 1978 and 78 Firebird and Trans Am models. High quality new tooling ensure a no leak original fit every time. This kit is made to O.E. specs for a great fit. Includes the weatherstrip seal up the a-pillar, around the t-top cut-outs on roof, and then back down the b-pillar behind your head for both sides. Correct molded ends with exact profile make installation a breeze. Use with PART# WEA-2019 Side Rail Seals for a complete T-top rubber kit. This is the later Second design which is less common and far more rare. You can easily tell the difference between the two by looking at the roof and headliner inside your car. The First Design uses weatherstripping around the t-tops to hold the headliner up, and the Second Design used plastic trim (much like the later more common Fisher T tops) to hold your headliner in place. This is a two piece set that goes up your pillar post, around the t top glass, and down the quarter panel sail edge. Please double check your car and confirm the version you need as this rubber set is non-returnable for any reason. This excellent quality kit is Made in the USA! New correct Hurst hatch t-top weatherstrip set for your Firebird or Trans Am. Exact fit for all 76 - 78 models with the smaller Hurst t-tops. This is the early First design with the lip that fits over the edge of your headliner for support. The First Design is the more common of the two and found on most Trans Ams. You can easily tell the difference between the two by looking at the roof and headliner inside your car. The First Design used this weatherstripping around the t-tops to hold the headliner up, and the Second Design used plastic trim (much like the later more common Fisher T tops) to hold your headliner in place. This is a two piece set that goes on your t top side to seal the window when rolled all the way up. Please double check your car and confirm the version you need as this rubber set is non-returnable for any reason. This excellent quality kit is Made in the USA! High quality Resto-Fit Series tooling ensure a no leak original fit every time. This kit is made to O.E. specs for a perfect seal with exact details. New manufacturing process to give the original latex look with a new stronger rubber compound. Includes the weatherstrip seal up the a-pillar, around the t-top cut-outs on roof, and then back down the b-pillar behind your head for both sides. Correct molded ends and exact profile make installation a breeze. Use with WEA-13 for a matching T-top Weatherstrip Side Rail Set. High quality Resto-Fit Series tooling ensure a no leak original fit every time. This set is made to O.E. specs for a perfect seal with exact details. New manufacturing process to give the original latex look with a new stronger rubber compound. This is a pair of the weatherstrip seals that mount to the outside edge of the T-top. This is the rubber piece that the door glass rolls up into on the roof mounted t-top. Correct molded ends and exact profile make installation a breeze. Use with WEA-12 for a matching T-top Weatherstrip Main Body Seal. Now finally available from Firebird Central! New side rubber flaps for your Firebird. Exact fit for all 78 - 81 T - Top models. Fits on the outer edge of your t-top, goes between the side rail weather stripping and the t top itself. Sold as a pair. High quality Resto-Fit Series tooling ensure a no leak original fit every time. This kit is made to O.E. specs for a perfect seal with exact details. Includes the weatherstrip seal up the a-pillar, around the t-top cut-outs on roof, and then back down the b-pillar behind your head for both sides. Also includes the weatherstrip seal that attaches to the removable t-top, where the door glass seals into. Correct molded ends and exact profile make installation a breeze. Pontiac Firebird T-Top Surround Seal and Side Rail Kit. Replaces 10165494, 10165495, and 10165496 for Driver Side and Passenger Side. Also replaces GM #'s 10198208, 10198209 & 10165500 for 82 - 92 Third Gen T-Top models. New complete roof seal set for your third gen Firebird with t-tops. Complete re-issue of the original 82 - 92 Third Gen Firebird and Trans Am T-Top weatherstrips including all necessary components. 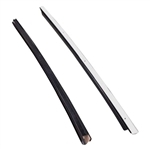 This set includes the correct molded main roof weatherstrips for both passenger and driver sides and all six side rails pieces that install on your t top glass. Both main outer rubbers, with steel track channels for moutning and even the flap rubbers, just like the originals! Also includes instructions. Awesome eight piece kit. Replace your T-Top weatherstrip with this new set today! Installs exactly as original and will eliminate rattles and noise caused by an insufficient sealing. Will also keep rain and other weather related elements from seeping into the interior. This 8-piece set contains right and left hand weatherstrip seals and all plastic gutter strips necessary to repair both sides. Includes instructions. Note: Early 1988 models featured an interlocking slider bracket molded into the T-Top body side weatherstrip. This replacement weatherstrip does not feature the bracket but it will install and function correctly on early 1988 models. New outer drip edge side seals for your 82 - 92 Firebird or Trans Am. These are the plastic piece on the t-top itself with studs. Also attached is a strip of pre-installed 3M adhesive used for installation. These seals are commonly missing or cracked. Replacing these will aid in keeping wind and rain out of your t-top third gen Firebird. Sold as a pair. Order yours today! PLEASE NOTE: Not to be confused with WEA-15, which is the t-top rubber seal. Check your t-tops for rubber or plastic drip edge version. This is the Plastic Style. WEA-15D is the Rubber Style. Replaces GM part numbers 10198353 and 10198352. New outer drip edge side seals for your 82 - 92 Firebird or Trans Am. These are the rubber pieces on the t-top itself. Also attached is a strip of pre-installed 3M adhesive used for installation. These seals are commonly missing or cracked. Replacing these will aid in keeping wind and rain out of your t-top third gen Firebird. Sold as a pair. Order yours today. PLEASE NOTE: Not to be confused with WEA-15, which is the t-top rubber seal. Check your t-tops for rubber or plastic drip edge version. This is the Rubber Style. WEA-15E is the Plastic Style. Replaces GM part numbers 20297495 and 20297494. New Muscle Car Industries Resto-Fit Series tooling ensure a no leak original fit every time. This kit is made to O.E. specs for a perfect seal with exact details. Includes the weatherstrip seal up the a-pillar, around the t-top cut-outs on roof, and then back down the b-pillar behind your head for both sides. Also includes the side rail weatherstrip seal that attaches to the removable t-top, where the door glass seals into. Choose either the hard plastic or rubber drip edge seals for the removable t-tops to be incuded as well in this kit. Correct molded ends with peel and stick adhesive and exact profile make installation a breeze. Order yours today and save on this high quality set. New Third Gen T-top Weather Strip Seal Channels. Correct outer side rail rubber retainer metal channel for all 82 - 92 Firebird models with Fisher T-tops. These mount to the removable 1982 - 1992 T-top panel. Used to hold the side rail rubber weather strip to the t-top glass panel. Complete with correct foam mounting strips for a perfect fit. Sold as a pair. These are use to hold the WEA-15 Side Rail Seals to the T-top. New correct outer side rail seals for 82-92 Firebird models. These mount to the T-top glass panel. If the door glass was rolled all the way up, it would seal to these rubbers. Muscle Car Industries weatherstrips are made to O.E. specs for a perfect seal every time. Side rails have the correct hollow inner construction with dual inner walls to form the best seal on the market. Sold as a pair. New Muscle Car Industries Resto-Fit Series tooling ensure a no leak original fit every time. Correct outer side rail seals for 93-2002 Firebird models. These mount to the 93-02 T-top glass panel. If the door glass was rolled all the way up, it would seal to these rubbers. Muscle Car Industries weatherstrips are made to O.E. specs for a perfect seal every time. Side rails have the correct hollow inner construction with dual inner walls to form the best seal on the market. Sold as a pair. Original GM new old stock door and roof frame opening weatherstrip for your Firebird or Trans AM. Exact fit for all 1993 - 2002 T-Top models. Does the right hand, passenger side. Fits all 1993 1994 1995 1996 1997 1998 1999 2000 2001 2002 T-top models. Limited quantity, when they are gone, they're gone!! !